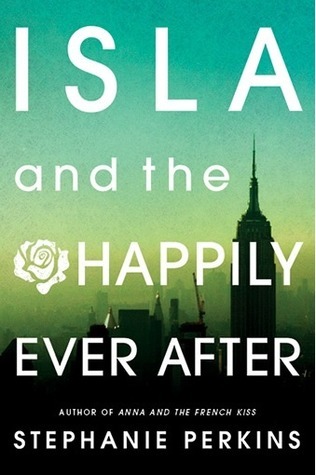 Isla attends the School of America in Paris, where she has had a crush on Josh Wasserstein for years. This year he finally notices her and they start dating, but it's not an easy happy ending for this troubled couple. This is the third in a series that began with Anna and the French Kiss and continued with Lola and the Boy Next Door. Each book has cameos of characters from the others, but each is focused on a different couple. I liked this book well enough, but didn't love it like the first two. The story arc was a bit flat and lacked the dramatic tension of the other novels in the series. The conflict was pretty much based on Isla being kind of neurotic, making assumptions about how Josh felt without any evidence or bothering to ask him. This is a typical romance novel trope and it is lame. There were also some grand romantic gestures that happened near the end which didn't have the intended effect on me. In one case, I was really turned off by something that should have been significant and touching because it happened in a life context that seemed just not right. I'm sorry to be vague, but I'm trying hard to explain my issues with the book without revealing spoilers. Have said all that, I still liked listening to it and even though I just didn't find the story as interesting, I still enjoyed getting to know these new characters and visiting again with those from the previous books. I really liked Josh as a love interest. Josh was working on a graphic memoir about his high school years and planning to attend cartoon school in Vermont. (This is a real legit thing: my friend Mitra Farmand went there and she just got published in the New Yorker, so.) Josh's dad was a senator running for re-election, and now that Josh was old enough to vote he was expected to fly back to the U.S. for the election and be on tv with his family. In the meantime, he kept breaking rules at school and getting into all sorts of trouble which threatened both his education and his relationship with Isla. I liked Isla also. She didn't have as clear a path as Josh did, and they had many conversations about what she could potentially study in college. Her aimlessness felt realistic. How many teenagers have some obvious, special talent or know what they want to do with their lives? She had an older sister, Jen, who previously graduated from the same school, and now her younger sister Hattie has just started there. Hattie is not the nicest person in the world and their relationship is a struggle. Isla's best friend is a boy named Kurt, and although I really enjoyed their friendship, I thought Isla was a bit of a dolt about it. She was totally shocked to find out that people thought they were a couple, and can't imagine why a boy she was dating would feel jealous about her relationship with Kurt. I mean, they spend the night in each others' rooms, for crying out loud! It wasn't a terrible ending to the series (this IS just a trilogy, right?) but I still think it was the weakest of the three stories. It was good, just not as great as the other two. Now I'll spend a week or so getting caught up on podcasts before I start another audiobook, but I have no idea what it will be. It needs to be less than 10 hours long preferably, and fairly uncomplicated, but different from these 3 teen romances I just listened to all in a row. A coworker suggested Me and Earl and the Dying Girl by Jesse Andrews, which I might try, but I'm still looking for more ideas. Any suggestions? Let me know in the comments!